We are specialized litigation counsel, similar to barristers in England. 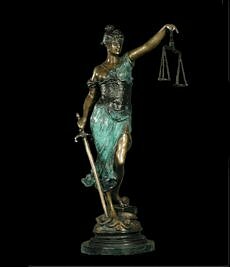 We deal with courtroom advocacy; litigation and appeals. Efforts include conceptualizing and trying cases, as well as drafting pre-trial motions and doing discovery involving hundreds of thousands of documents -- often to assist a client's usual lawyer. This distinguishes us from general practitioners or transactional lawyers who have more routine contact with clients, and tend to do non-trial legal work. "It is as clear to us as it was to the trial court that there was a sharp conflict in evidence and the testimony of many witnesses with regard to plaintiff's complaint. This was a classic jury case; the trial court correctly applied the law of this circuit in refusing to disturb the jury verdict, and the order denying judgment n.o.v. and for new trial will be affirmed." A federal jury awarded SCRG $28.7 million in damages Thursday in U.S. District Court, finding that SCA failed to disclose toxic "red mud" on the property it sold in 2002....SCA, is a subsidiary of Alcoa Inc., the worldwide aluminum company. The trial spanned 10 days before District Judge Harvey Bartle. Attorneys Joel Holt and Carl J. Hartmann III represented SCRG....$12,617,867 for a breach of warranty and fraud, another $6,142,856 for punitive damages and an additional $10 million for negligence. Note: We take on litigation matters exclusively. Due to our present commitments, we only accept new clients for issues where the amount exceeds $10 million or the number of documents will exceed 100,000 -- except where we are asked to act as co-counsel to a client's existing attorney. For more than 25 years, Carl Hartmann has been lead trial and appellate counsel in complex federal court cases throughout the nation -- in such diverse areas as commercial defense, corporate control, employment, civil rights, intellectual property, environmental, telecommunications and real estate. He has been counsel for major corporations, other law firms, and individuals; as well as special outside investigative counsel for the federal government. The U.S. Circuit Court of Appeals for the Tenth Circuit described his victory against the City of Albuquerque following a difficult, extremely high-visibility federal trial as a "classic jury case." It is as clear to us as it was to the trial court that there was a sharp conflict in evidence and the testimony of many witnesses with regard to plaintiff's complaint. This was a classic jury case; the trial court correctly applied the law of this circuit in refusing to disturb the jury verdict. That three-judge federal appellate panel also expressed shock at the long, brutal nature of the case, noting "the litigation and appeal took several years, involved extensive discovery and was marked by bizarre efforts on the part of the City, its officials, the police department and others to discredit the Plaintiff, his friends and anyone that dared support him, and to obscure evidence." In 2016, with Joel Holt and Linda Singer, he represented the Government of the U.S. Virgin Islands in a $1.5 billion civil victory over the Hess Corporation. They secured the liquidation of Hess' HOVENSA Oil Refinery (requiring an additional fight in bankruptcy court), a 40-year operating agreement with Arclight (the new buyer of the facility), $220 million immediate cash payment to the Government, $800 million in additional long-term value (including annual guaranteed payments in lieu of taxes, large tracts of land and 121 co-located houses) as well as the dismissal of $320 million of Hess subsidiary tax claims. As a direct result, in July of 2018, the Governor announced Arclight and BP would upgrade and re-open the refinery with an immediate capital infusion of $1.25 billion and over 1300 new jobs. The Legislature approved the project on July 26th, and on November 30, 2018 it was a done deal. Along with Kimberly Japinga, Joel Holt and Jeffrey Sepesi, he obtained a $28.7 million federal jury verdict under Delaware law against Alcoa, which was represented by two large national law firms. This was a vigorously contested 2011 fraud and breach of contract action, and that award included more than $6 million in punitive damages. The trial judge later upheld that punitive award, finding that because of the "hidden misrepresentations and the involvement of top officials at the company. . .the fraud was 'outrageous.'" The verdict led to the 2012 entry of a consent decree in a series of associated CERCLA/environmental cases which required Alcoa to fully remediate and restore the disputed areas -- and a 2014 settlement with the remaining defendants, including Lockheed, for more than $50 million. These and other actions can be reviewed under the "Cases" tab, including a 2014 summary judgment recovering control of a business with annual sales of more than $100 million and holding $43 million in after-tax cash where the court stated "any delay in achieving final resolution impedes the Court system as the filings of these parties have been prodigious in volume and frequency," the 2012 recovery of $12 million in art from Athens, Greece in actions in both New York federal court and Greece -- and a Washington, D.C. federal court decision for the longest-serving, highest-ranked female regional director in the National Park Service where the Court stated the following about a political appointee's retaliatory lies to the U.S. Secret Service: "The incident involving security for the President was....offensive and deeply insulting to a loyal American who had spent her life in service to her government. It was unfathomable to the Court." As lead counsel and the trial lawyers for legal publisher HyperLaw in the 7-year long Southern District of New York "HyperLaw Trilogy" cases, Carl Hartmann and the late Paul Ruskin won the largest federal action regarding database protection and electronic publishing in a generation. See WIRED article and the Paul Weiss law firm's post-litigation analysis in the New York Law Journal. For more than 100 years, courts sent most of the legal decisions in the United States to West Publishing for free, to be printed verbatim in its National Reporter System of books. 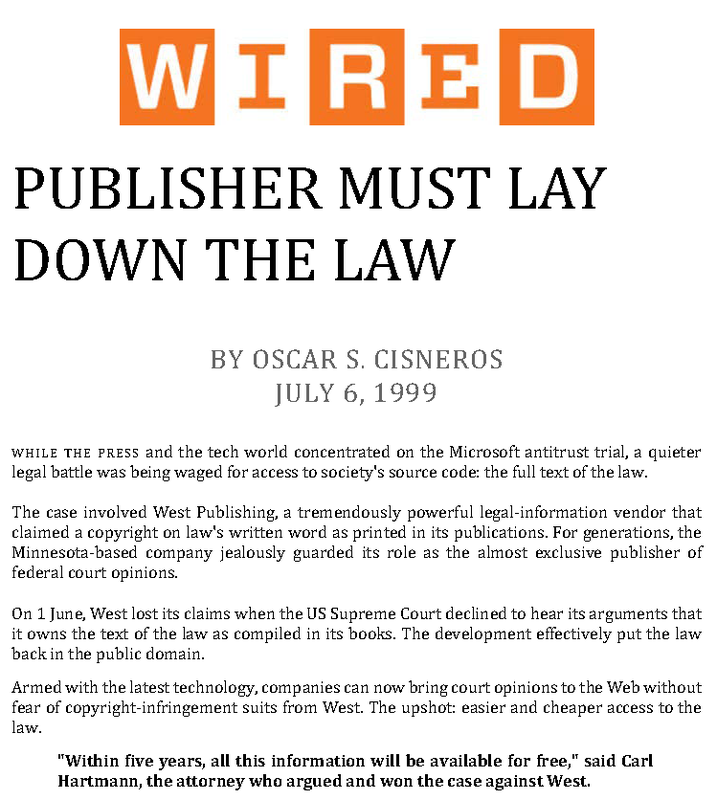 With the advent of the internet, West claimed that nobody could access that law online without paying West to copy these cases from its books -- either directly through its WESTLAW system, or indirectly because of licensing fees it charged for such use. This problem was compounded when West entered into two secret agreements with the other online legal database provider, LEXIS. Between them they controlled computer access to the law and like any good monopoly does, charged outrageous prices for their own services or for "use" of the cases by other publishers, authors, and low-cost online services. The resulting 'WESTLAW-LEXIS tax' was ultimately "paid by every lawyer, court and individual who came in contact with the legal system, and it shut poorer parties out of critical resources....it was billions of dollars." Hyperlaw's lawsuit resulted in...a demarcation of the boundaries of West's copyright claim and thereby broke West's monopoly grip....When David vanquished Goliath, the Israelites rewarded him by making him their King...all [Hyperlaw] asks for its efforts is that it be reimbursed for the substantial legal fees West forced it to incur in order to vindicate the public's right of access to judicial opinions. It prevailed against an adversary that did all that it could to make this litigation as expensive as possible, no doubt hoping that a small company such as Hyperlaw would not stay the course. Following the trial, he and Ruskin successfully argued the two appeals against Prof. Arthur R. Miller (Wright & Miller, Federal Practice and Procedure) in winning affirmance in the Second Circuit Court of Appeals. On June 1, 1999, the U.S. Supreme Court then denied West's two Petitions for Certiorari. "That development effectively put the law back in the public domain." Co-plaintiff Matthew Bender did not participate in the portion of the case related to the text of judicial decisions at either the trial or appeal levels. Nor did it participate in the antitrust action in D.C. federal court where HyperLaw pursued West for antitrust violations and modification of the DOJ Antitrust Settlement in West's efforts to purchase other publishers and ‘license’ judicial decisions to its "competitors" such as Lexis. West Antitrust Decision I.
HyperLaw therefore remains the only potential appellant prepared to test the validity of the Final Judgment. The Court finds that HyperLaw has sufficiently demonstrated that it will suffer actual, concrete, particularized injury traceable to the entry of the Final Judgment, both substantive and procedural; it therefore has standing. See Lujan v. Defenders of Wildlife, 504 U.S. 555....The issues raised by this case are important, and their presentation to the Court of Appeals should not be foreclosed by this Court. HyperLaw argues, for example, that this Court has misinterpreted or misapplied the Court of Appeals' recent decision in United States v. Microsoft Corp., 56 F.3d 1448 (D.C. Cir. 1995). HyperLaw also raises questions concerning the breadth of document disclosure required by the Tunney Act and the appropriate public comment procedures to be followed when a proposed consent decree is revised, perhaps multiple times, after the initial 60 day public comment period required by statute has expired. Without the intervention of HyperLaw no party will be in a position to present these issues to the Court of Appeals. Finally, it should be noted that the expert analyses in the New York Times and many other publications proved to be absolutely correct, as vendors such as Fastcase now offer online research for free in cooperation with more than 40 bar associations -- and the cost of paid case research is a tenth charged at the time of the litigation. For an exhaustive description of what West claimed as its "authorship" and an analysis of the law related to those claims, it is useful to read West's two Petitions for Re-Hearing En Banc in the Second Circuit (text and citations) filed after its loss, as well as HyperLaw's Opposition Briefs (text and citations); and HyperLaw's U.S. Supreme Court Opposition.